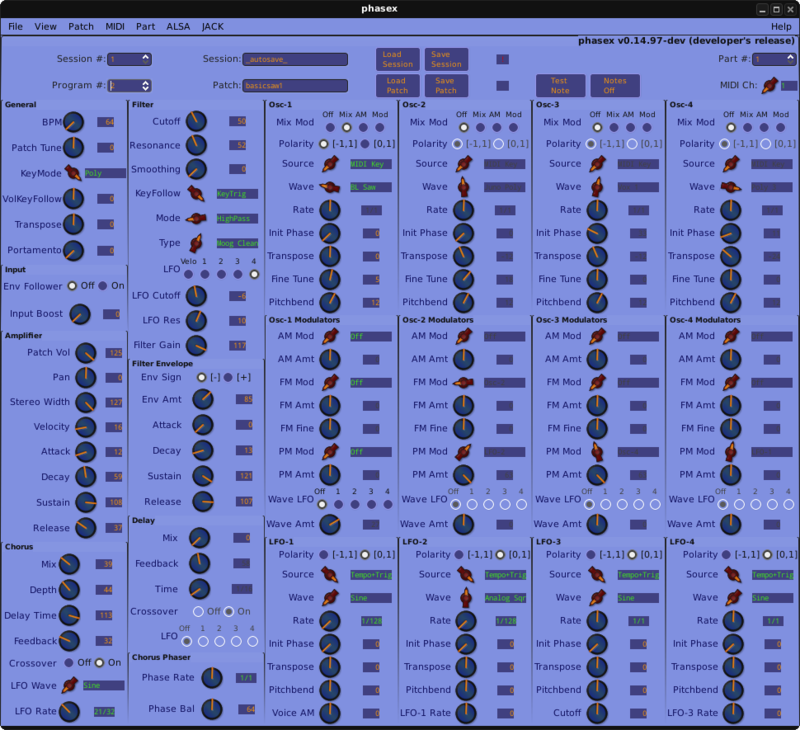 Phasex, or Phase Harmonic Advanced Synthesis EXperiment (screenshots above are two different themes of version 14.97, "Developer's Release") is a virtual realtime software synthesizer for the linux platform, developed by William Weston, based on the concept of "phase offset modulation." It is mono/poly-phonic, and can be run either as a plug-in or as standalone. The GUI allows parameter display either on one single page (as shown above) or on two pages, with the oscillator section on the second page. Phasex includes 4 oscillators, each with a series of waveforms, including bandlimited saw and square waves, triangle wave, sine, vox and others. External audio input (such as a second synth, or soundfont player, sampler, etc.) can also be routed as input, modulated through the envelopes, and reproduced as MIDI inputs are received. AM, FM and PM capabilties are provided for each oscillator. The newer version 14.97 includes an extra modulation control for each of the four LFOs: Voice AM, LFO-1 rate, Cutoff and LFO-3 rate, respectively. All four oscillators, as well as the four LFOs, can provide bipolar and unipolar output. Transposition, detuning and pitch bend can be set independently for each oscillator. The filter section includes a variety of filter arrangements, such as LP, BP, HP, LP+BP, LP+HP, and each of these can be set as either "retro" or "dist;" version 14.97 includes Moog Dist, Moog Clean, 3-pole Dist and 3-pole Raw options as well. Both amplitude and filter sections include traditional ADSR envelopes. Chorus, delay and phased chorus effects are located in the lower lefthand area of the interface. 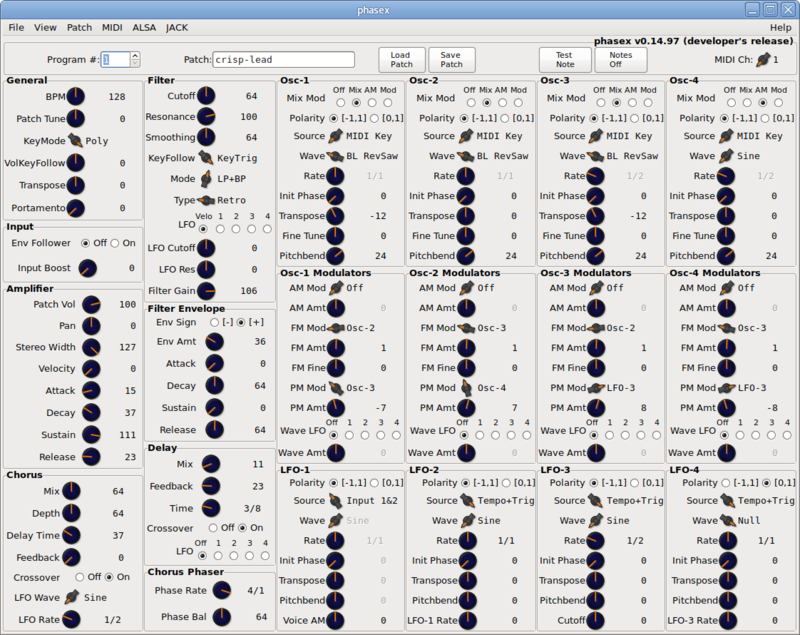 Pan and stereo width controls are located on the left side of the GUI. The preferences section in the drop-down menu allows control of audio servers, normal/over/under-sampling, number of polyphony (up to 16 voices), theme and resolution options, preset saving options, etc. Ken Restivo Collection -Ken Restivo's collection of patches for Phasex. NB: Depending on the version you are using, these patches may or may not work. Phasex Presets -A collection of presets for Phasex. NB: Presets collected using different versions of Phasex; compatibility will depend on your version. --58 presets, updated Feb. 27, 2018. Phasex Presets 14.97 -My rolling collection of presets for Phasex - "Developer's Release." Note that these presets will work ONLY with this release (14.97). Some of these presets are modifications of the default presets provided in the Librazik-2 distro repositories, as well of some of my own, ported from the previous version of Phasex. This newer release will probably be the only one I will add new presets to in the future. --42 presets, updated May 10, 2018.